I would like to wish everyone a joyful new year. 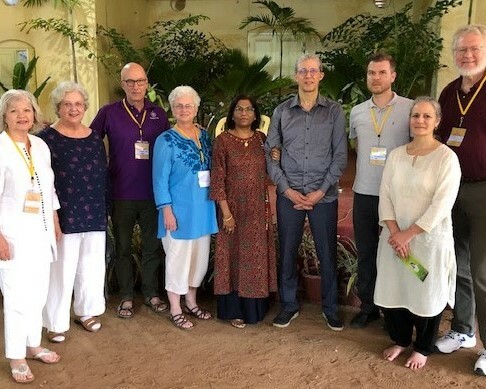 From the photo, you can see that a few of us from the US were in India over the holidays attending the international convention. As always, the international convention is like a family reunion. (Not too different from our national summer convention at Olcott!) It was wonderful to spend some time with TOS International Secretary Nancy Secrest who is now living in Adyar working as international treasurer. Kathy Gann, who is standing next to Nancy, visited Adyar and India for the first time as did Christopher Dixon, TSA’s chief of staff. Traveling with others often allows us to see the world through different eyes. Especially when it is a new experience for them. I lived in Adyar for six years and have travelled to India several times. But I never tire of visiting Adyar. My heart is there. The energy from those of the past who lived and worked there, dedicating their every moment to the movement, remains. There is a solidity, a stillness, and a serenity which remains vibrant. It was lovely to watch my traveling companions bear witness to this and soak it in as I do with every visit. As we start the new year, I would first like to thank all of you who generously donated to the TOS through our annual fund drive. It is such an honor to work for an organization like ours that is supported by such loving inspiring people. As Gibran said “Work is love made visible” and for many of us, our work is to relieve the suffering in the world through one act of kindness after another. Those acts of kindness are manifested in different ways. Sometimes it is through donations of money, sometimes it is through the donation of time. But whatever we can do to help another, we must do without question. This is the only way universality can be achieved. We are also glad to announce that we will soon be offering the ability to donate on a monthly basis versus a lump sum at the end of the year. Recurring donations tend to be much easier for people because once it is set up, you no longer need to worry about writing out a check! We look forward to having this in place very soon. May loving kindness surround you.